When a person is more than three score and ten but has only recently celebrated a first birthday as a Rotarian a number of first impressions about Rotary remain fresh. First among those impressions is its sheer size, not only in the number of members, but more importantly in its organizational components. Few, if any, of the components, however, seem to be standing still. Change seems to be everywhere. When change is rampant, one of the human characteristics which usually accompanies it, is lots of discussion. Yet curiously, even with the desire of Rotary International to encourage all Zones, Districts and Clubs to create websites and social media sites there is precious little commentary or opinion expressed about the direction Rotary, Districts or Clubs may be taking. If there is any exception it is at Facebook or Linkedin that a range of comments may appear. Real opinion pieces do not appear on club or district websites and even where blogs do exist, if they are associated with an official website, they provide little more than “news” items rather than commentary. 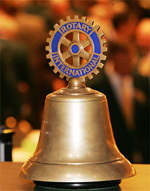 In a couple of cases Rotarians have blogged on Rotary as independents. An example of the former is a new blog named “Forum” at Zone 24 and 32, while an example of the latter is “Innovate Rotary!” a blog by Greg Krauska. Lack of commentary is no doubt due to a number of factors. The voluntary nature of the enterprise, a less than thorough knowledge of all its parts, a lack of confidence in one’s own ability to write for a public audience, and/or perhaps most importantly an unwillingness to be critical of the organization or leader we respect and admire. Each of our meetings is closed with the 4 way Test. Recently, RI Director-elect Lars-Olof Fredricksson in an article “A new look at global ethics and The Four Way Test” asks: “Is it right to be dishonest for a good cause?” It is a question we should apply even to our own organization. It we are being truthful, fair to all concerned and strive to do it for the benefit of all, then Rotarians must speak freely about the organization. Hiding our concerns under a barrel or being critical behind a leader’s back is not the way Rotarians should build goodwill or better friendships. With that in mind District 5550 is adding another component to its website. It is establishing an editorial and opinion component. These will be posted in a new sub-website running on blog software. This is in order to permit Rotarians and others to post comments of their own to the ideas expressed. Its name is 5550opinions. Our philosophy is that as adults, learning grows best by doing and through discussion. As the “Communications Committee” we also want to do something else. We are trying to create a District website that has all the features of a modern daily newspaper website. Newspapers thrive on their editorials, columnists, and guest opinion pieces. We hope District 5550’s website will thrive on 5550opinions. To thrive, in this case means we hope this will increase the number of visitors to the District 5550 site. As a result we would welcome volunteers to become columnists. This entry was posted in Editorials and tagged District 5550, Openness, Opinion, Rotary, Speech. Bookmark the permalink.